Insects that are potentially harmful to agriculture have shaped agricultural practices and policy-making worldwide. For some species and geographies, historical research still needs to be done. This is not only crucial to understanding the past, but also the present and future of pest surges. 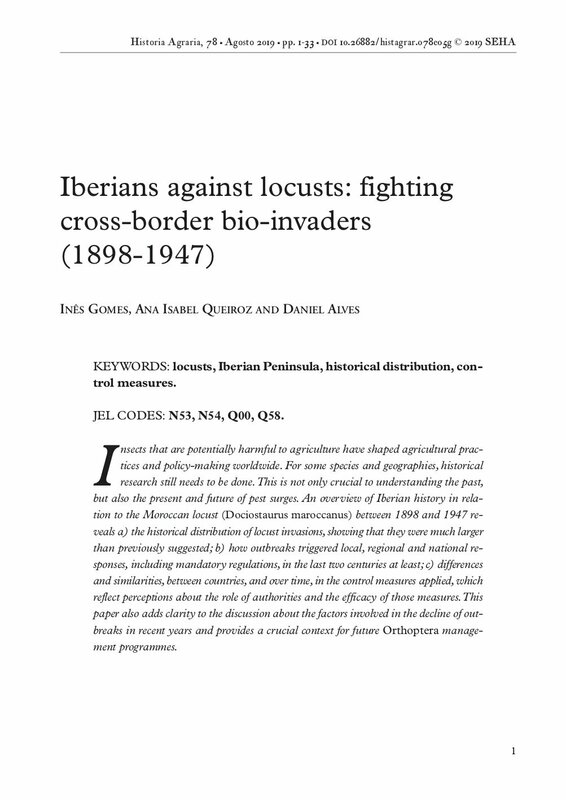 An overview of Iberian history in relation to the Moroccan locust (Dociostaurus maroccanus) between 1898 and 1947 reveals a) the historical distribution of locust invasions, showing that they were much larger than previously suggested; b) how outbreaks triggered local, regional and national responses, including mandatory regulations, in the last two centuries at least; c) differences and similarities, between countries, and over time, in the control measures applied, which reflect perceptions about the role of authorities and the efficacy of those measures. This paper also adds clarity to the discussion about the factors involved in the decline of outbreaks in recent years and provides a crucial context for future Orthoptera management programmes.